“Breakin’ Through,” created by artist D. Michael Thomas, was revealed today (Thursday) in a ceremony at the University of Wyoming Marian H. Rochelle Gateway Center. 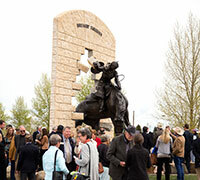 The sculpture celebrates women’s contributions to Wyoming. Featuring a woman rider breaking through a sandstone wall, the piece stands almost 16 feet tall and 8 feet wide. The sandstone wall is more than 20 feet tall and 17 feet wide. The sculpture is located on the north side of the Gateway Center. Thomas’s sculpture was made possible by a donation of $500,000 from Marian H. Rochelle and her daughter, April Brimmer Kunz. Originally, there was going to be only one statue at the Gateway Center -- a representation of the iconic Wyoming horse, Steamboat. Artists Chris Navarro and D. Michael Thomas were given the freedom to create what they wanted, as long as it was approachable; photos could be taken with it from every angle; and the representation of the horse and rider was aggressive. A winner would then be selected. Both artists took this assignment with enthusiasm. They came up with remarkably different sculptures, knowing that only one of them would be chosen to be displayed at UW. The clay maquettes were put on display for the UW Foundation board members. Both sculptures were so exciting and dynamic that it was ultimately decided they both needed to be part of the facility. Thomas’s original concept was a cowboy and his horse busting through a sandstone wall. After both sculptures were chosen, he was asked to make the rider a woman, which he agreed to do. Thomas has sculpted for more than 30 years. He grew up working cattle ranches in western Wyoming and graduated from UW in 1977 with a degree in animal science and pre-veterinary medicine. He worked in the agri-business field as a loan officer and manager of a feed and ranch supply business for 16 years. In 1993, he became a full-time artist. Thomas’s art depicts cowboys and events he participated in or witnessed firsthand. Rochelle is one of the largest donors in UW’s history. In 1990, the College of Agriculture and Natural Resources awarded her the Outstanding Donor award. She received the Cornerstone Award in 1999 and, in 2000, she received the Athletics Hall of Fame Special Achievement Award. Brimmer Kunz graduated with her J.D. from UW in 1979. In 2003, she became the first woman elected president of the Wyoming State Senate. She served as a Wyoming state representative from 1985-1992 and a state senator from 1992-2004, representing Laramie County as a Republican. She was Senate majority floor leader and Senate vice president. The Gateway Center is UW’s “front door.” It is a dramatic welcoming center with a state-of-the-art technological infrastructure that was funded entirely through private support. It is home for students -- past, present and future. It is a place for prospective students and families to enter the university; for gatherings of current students; for alumni to arrive and celebrate the history and traditions of their alma mater; for friends to participate in the university’s programs; and for corporations and organizations to interview and recruit UW students. It also serves Wyoming’s donors, athletics fans, supporters, friends and the general public. The facility is home to the UW Alumni Association, Admissions, Career Services and the Foundation, and contains office and collaborative space for these units as they support and promote the university.